Masashi Hamauzu: None consciously, but while I was composing some appeared naturally… The world view carried over from the previous game, so certain its motifs crept into the music at points. When I compose, all of the pieces in a single game are related to each other. There may be pop or rock in the score, but they aren’t completely separate pieces, and they will have some of the same motifs as the rest. In Final Fantasy, characters reappear over time, and I’ll take a bit of a motif from a game I composed for, and add the briefest of references to it. There are a number of such places in XIII-2, but I suspect that out of a million people only two or three will recognize the oldest of them. Masashi Hamauzu: Final Fantasy XIII‘s “Blinded By Light” was fortunate enough to be quite well received, but as its composition had taken a good deal of effort and planning, I was afraid that it would be difficult to write something at the same level again. I couldn’t simply replicate the original, but if I took it in a new direction, there would be no way it could surpass the original. While I was wondering what to do, [the director] Toriyama-san told me “I want you to write a music that sends a message, like Japan is rising up energetically.” When I heard that, a melody popped into my head in about ten seconds. I thought, “let’s end this meeting quickly so I can write!” (laughs) So “Warrior of the Goddess” was finished without difficulty, and it was relatively well-received when it showed up in the trailer. Q: Did you feel pressured by the first game’s good reception? Masashi Hamauzu: “Blinded by Light” was very polished, and I felt that it would be impossible to compose music that surpassed it. But I felt I could equal it, and personally, I thought that that was a more comforting direction to go. Masashi Hamauzu: Last time I was the only one in charge, but we’re not yet at the point where I can take time to listen through the whole score. I will say, though, that I’ve worked with Mizuta-san and Suzuki-san for a long time, and I know them quite well. They’re both very talented individuals. There are differences in our music, but when it is put into the game, mysteriously it sounds completely coherent. I think it gives the game another layer of depth. Naoshi Mizuta: For me, the scenario is a wellspring for my ideas. 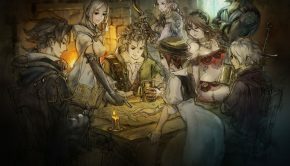 As for Final Fantasy XIII-2, the director Toriyama-san stressed very strongly that I should “break away from my image of the previous Final Fantasy games and create something new,” so I started by asking myself, “what would be new?” That is to say, my starting point here was completely different from that of Final Fantasy XI. Naoshi Mizuta: Battle themes, for an example, play repeatedly within the game, so they have to be written so as not to become tiresome after any number of listens. This doesn’t change, no matter what the project. As I was looking for something new, I was conscious of the characteristics of past Final Fantasy games. With the field areas, it would have been difficult to create something new in the acoustic vein of previous games in the series, so I sought to break away from it to a certain extent. I added vocals, and although it has its own pros and cons, I added rap tracks as well. I feel that in taking away some of these limitations from the battle themes as well, I was able to expand the boundaries a bit. Naoshi Mizuta: “Caius’s Theme” took the most work. I just couldn’t get it approved [by the sound director], and I redid it over and over. In the end I must have created more than four different tracks. We were in the final stages of production, and I spent close to a whole month on that one track… In the end, it turned out very well, though. I had never had so much difficulty with anything before. Naoshi Mizuta: I find that those parts, or rather, my pieces just seep out of somewhere. If I hear my own work, I realize “oh, I put that in there,” but that is only what I feel. I would much rather that listeners told me what they hear as characteristic. Naoshi Mizuta: I feel that all three of us working on this score are unique. Suzuki-san’s electronic pieces are amazingly cool, and Hamauzu-san’s orchestral pieces have such exquisite beauty, despite their sense of scale. As for me… I don’t know myself (laughs). In any event, the soundtrack has such diverse music, so it doesn’t feel limited to a single color; in my view, it is a fun, multi-colored score. Naoshi Mizuta: There are many Final Fantasy fans who hold the music as well in high regard, so I always feel that I must not do a bad job. But you can’t get anywhere if you’re always on the defensive, so I’m going to show people things that made me wonder, “is it okay to do this?” I hope that they are accepted. I’m worried, but I look forward to hearing what people think. Mitsuto Suzuki: With Final Fantasy XIII, I handled arrangement of Hamauzu-san’s music, and our roles were determined by the material itself. Hamauzu-san handled the orchestral music, and I worked on the electronic music. Now I’ve broken out of that role, so I could create freely. To put it a different way, in the past I’ve had to submit to others’ judgment, but now I am the final judge of my work. On the plus side I can keep going until I get something I’m satisfied with, but the downside is that it never ends (laughs). I had a hard time letting something I had worked on go. 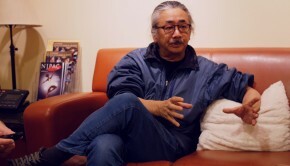 Mitsuto Suzuki: At the beginning, I was asked to provide “something with an edge”, and the music I normally compose has a kind of “edge” not found in any previous Final Fantasy game. So without going out of my way, I created what I wanted to create. The same goes for my method. Normally one would wait until a track gets to a certain level of completion, and then add drums, then strings, but this time I started by recording the drums, and then adjusted everything around them, which is a method I would normally never use. Rather than sticking to preestablished harmony when pressed for time, I preferred to work under inspiration via trial and error, and that was a vital element in the production. Mitsuto Suzuki: I love the tracks that singer Origa-san and violinist Aska Kaneko-san worked on. Regarding Origa-san, I happened to hear her singing on TV, and thought to myself “she might fit the track I’m working on right now,” so the next day I asked the development staff about it, and somehow it turned out that they had been watching the exact same program (laughs). Things moved very quickly, and that same evening we had made an appointment with Origa-san. There were all kinds of coincidences like that during production, and I’m glad that we ended up with something that we can be proud of. Q: In comparison to your co-composers, what would you say makes you think “that’s a Suzuki melody”? Mitsuto Suzuki: I don’t place any limits or restrictions on sound, so compared to their music mine feels overfilled with drum-heavy beats. Also, to use an expression of mine, it has “extreme silence”. Although there are as few sounds as possible and the music is quiet, it sounds extreme. Those are the two things I would choose. I’ve got both extremes covered, it seems (laughs). 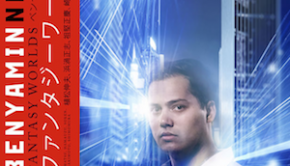 Mitsuto Suzuki: This project was composed by the three of us, but while people are playing the game, I would like them to listen normally, and not wonder “who wrote this track?” Our music was created for the game, so the details of the balance are fine-tuned. I want people to experience it as hearing the game. Posted on December 14, 2011 by Ben Schweitzer. Last modified on March 8, 2014.